Headed off to college? Tests aren’t the only thing you’ll have to worry about. 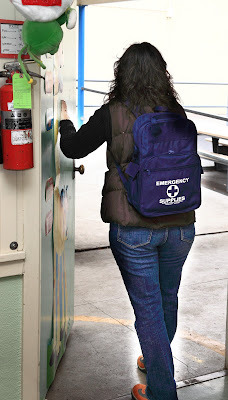 Whether you’re living in a dorm or an apartment, when you’re at college and off on your own for the first time, it’ s important to be prepared for emergencies like storms and power outages. Creating an emergency kit for school before you leave home is the best and easiest way to stay prepared. When it comes to creating an emergency preparedness kit for college students, there are certain items you should always keep in stock. We’ve compiled a list of essential college student emergency kit supplies, plus some emergency situation tips you can follow to stay safe. When you’re stuck and stranded, water is a must have. Try to keep at least a three-day supply of water in your home (one gallon per person per day), as well as an additional supply in your car when you’re traveling during bad weather. You should stock up on food that is high in nutrition, has a long shelf life and can be prepared and consumed without cooking. From emergency food bars to long-term supply kits, today there is a wide variety of both nutritional and tasty survival food available. A first aid kit can come in handy during minor and major emergencies alike. Your kit should include basic items like ibuprofen, bandages, antibiotic cream and burn ointment, as well as any extra prescription medications you need. A first aid handbook can come in handy when you don’t have access to the Internet and need to quickly learn how to treat burns, eye injuries, concussions and even more. If your cell phone dies, will you be able to contact anyone you know? While it may seem pointless during your day-to-day life, it’s important that you keep a written address/phone directory for friends and family at home. During power outages and without cell phone reception, you may also find it impossible to keep up with the latest emergency updates. It’s vital you keep a battery powered radio at home so you can stay informed about your surrounding area. Don’t forget the flashlight and to stock up on extra batteries as well! To protect your electronics (and school files) from being damaged during a power outage, you can purchase equipment that comes with built-in surge protection, or use a separate electrical surge suppressor. Remember not to turn on all your lights, appliances and electronics while the power is out, or you may overload the circuits when it’s restored. Familiarizing yourself with your college’s emergency plans ensures that whether you’re at home or on campus, you know what to do during a natural or man-made disaster. Many colleges also allow students to sign up for emergency texts so you can instantly be alerted of danger and given instructions on what to do next. While at home, you may have all the extra clothes, blankets and toiletries you need, remember to store some of these items (as well as a separate first aid kit) in your car so you can always be prepared. It’s also a good idea to keep cash on hand, in case you need to buy more supplies but can’t use debit or credit cards anywhere. Have your own tips for student safety? Tell us about them in the comments below!